Feel the buzzing energy of Philippine contemporary dance, find inspiration in the simplest things, bid farewell to a memorable hangout place, and more. Living in a tropical country doesn't mean you can't celebrate the four seasons when it comes to fashion. The SuperSale team have gathered only the best brands to showcase their fall collections-Celline, Moonshine, MOD, Soak Swimwear, Vanilla Breeze Clothing, Tonic, Elin, Fashionability-to name a few. Also, be a bag designer for a day as the team has launched Design Ur Bag Studio, a pocket event exclusive at the SuperSale bazaar. You can design and personalize your bag-choose the design, colors and put your monogram or initials. Mark your calendars, invite your friends and head on to SuperSale Bazaar's Mid-Year Sale, happening on July 18 to 20 at the World Trade Center from Friday to Sunday, 11 a.m. to 10 p.m.
Post on Instagram and Tweet your favorite looks and pieces to win prizes. Don't forget to follow @supersalebazaar and use the hashtags #supersalebazaar and #designurbagstudio. Tons of prizes await! Purchase tickets at the registration during the event. 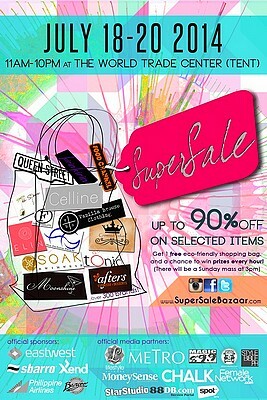 Visit www.supersalebazaar.com and www.facebook.com/supersalebazaar for more details. 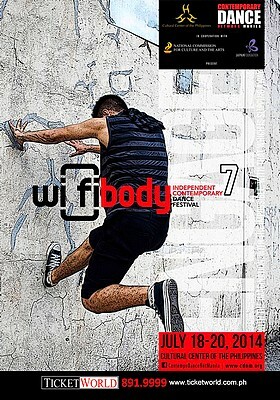 Don’t miss WiFi Body 7, opening on July 18, 7 p.m., at the CCP Studio Theater. The festival will run until July 20. The festival began as an attempt to corral the energies and ideas of a burgeoning contemporary dance scene that flourished in alternative and even unexpected spaces, bringing all these together back to the Cultural Center of the Philippines, taking independent contemporary dance out of its niche to present it to a bigger audience of art. After six festivals of dance that disturbed the mainstrea, and questioned the status quo, Philippine contemporary dance is no longer the odd man out, now having its own familiar identity. And so, it is timely that this year's WiFi Body Festival, the final WiFi Body Festival, takes a look back at all it has done and what it has become. Tickets are priced P309 and P206 on July 19, 9 p.m., and July 20, 8:30 p.m. 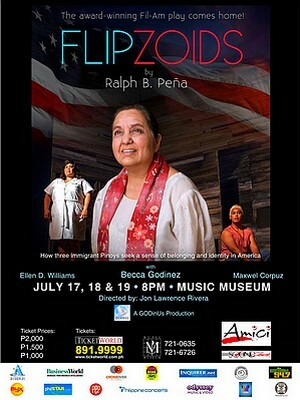 The award-winning Fil-Am play Flipzoids opens on July 17, 8 p.m., at the Music Museum. The production will run until July 19. Flipzoids tells the tale of three Filipino Americans who search for connections and a shared reality in Orange County, a place where "better" is always up for debate. Maxwel S. Corpuz plays Redford, a young man who arrived from the Philippines as a child with his parents but now lives very much alone. He primarily inhabits public restrooms, where a friendly chat between bathroom stalls is close enough for comfort - most of the time, anyway. Evangelina (Ellen D. Williams) is a fairly new arrival. She's a young nurse who holds all of American culture in a tight embrace, from the language to the arts to the glamour of upscale shopping malls. Then, there's her mother, Aying (Becca Godinez), who's fresh off the boat and not buying any of it. Instead, she tells stories of her homeland and clings to traditions and rituals that make her feel like she belongs someplace. Unfortunately for her daughter, that place is not Anaheim. Tickets are priced P2,284, P1,713, and P1,142. 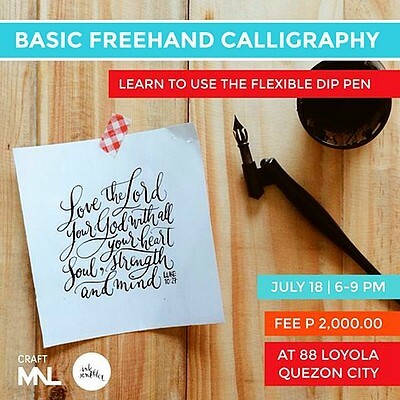 Sign up for Basic Freehand Calligraphy with Alexis Ventura of Ink Scribbler! It will be held on July 18, 6 p.m., at 88 Loyola, Quezon City. Familiarize yourself with the basic strokes and learn the rhythms of using the flexible dip pen in writing beautiful freehand calligraphy. The workshop fee is P2,000. Alexis Ventura is the 25-year-old behind the name Inkscribbler. Having studied marketing and business in university, calligraphy called to her in the midst of her "I need a new hobby" phase a couple of years back. She has then scribbled away to teaching workshops, working on commissioned pieces, and delivering in calligraphy and lettering collaborations both here and abroad. 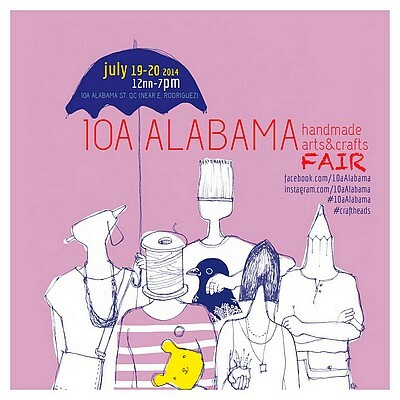 Drop by the 10a Alabama Handmade Arts and Crafts Fair on July 19 and 20, 12 p.m. This exciting art fair features vintage furniture and home decor, exquisite art finds, and creative sessions from Print Lab. 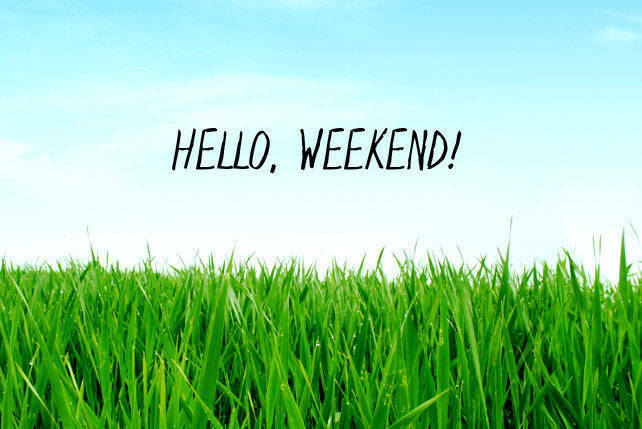 Celebrate all things handmade! 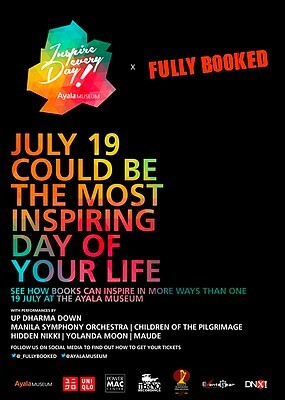 Ayala Museum will be launching Inspire Every Day on July 19 at the Ayala Museum. It will be a long-term campaign, which will be integrated in Ayala Museum's programming and digital communications. Go through the galleries while enjoying musical performances from Up Dharma Down, Manila Symphony Orchestra, Children of the Pilgrimage, Hidden Nikki, Yolanda Moon, and Maude. Guests are free to view the museum's permanent and ongoing special exhibitions, as well as booths showcasing the Filipinas Heritage Library's and Museum Shop's offerings. Its like-minded partner brands will also set up "inspire stations" to engage guests in creative activities using books, fashion, and technology. Together with Fully Booked, see how books can inspire in more ways than one! Regular tickets will be available upon registration on the event day itself. For more information, email hello@ayalamuseum.org or call 759-8288. 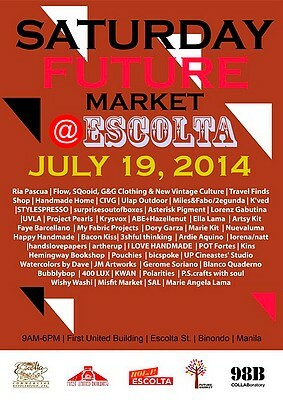 Start the weekend right with the Saturday Future Market @ Escolta on July 19, 9 a.m., at the First United Building in Escolta. 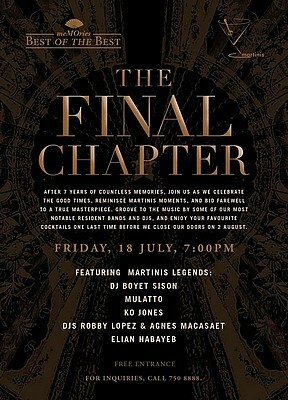 Save the date for The Final Chapter at Martinis on July 18, 7 p.m., at the Mandarin Oriental Manila. Entrance is free. After seven years of countless memories, join Mandarin Oriental in celebrating the good times, reminiscing Martinis moments, and bidding farewell to a rare masterpiece. Groove to the music by some of the most notable resident bands and DJs, and enjoy your favorite cocktails for one last time. Share this bittersweet moment with DJ Boyet Sison, Mulatto, Ko Jones, DJs Robby Lopez and Agnes Macasaet, and Elian Habayeb. 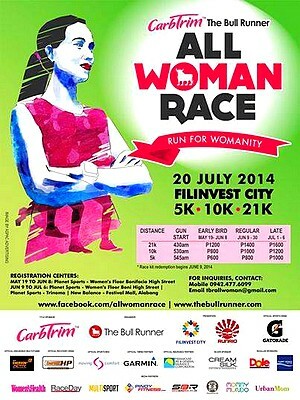 Celebrate womanhood at the Carbtrim-The Bull Runner All Woman Race on July 20 at the Filinvest City. Registration is priced at P1,000 (5K), P1,200 (10K), and P1,600 (21K). You may download the registration form fromhere and register at Planet Sports (Bonifacio Global City and TriNoma) or New Balance (Festival Mall). For inquiries, click here, email tbrallwoman@gmail.com, or call 0942-477-6099. 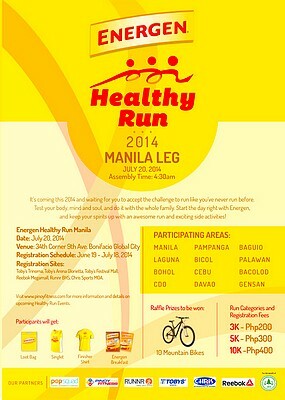 Join the Manila leg of the Energen Healthy Run 2014 on July 20 at the Bonifacio Global City. Time to test your body, mind, and soul with the whole family. Start the day right with Energen and keep your spirits up with an awesome run and exciting side activities.